Today we have revealed who our judging panel chose from our finalists in the ITV Calendar Fundraiser of the Year Award - part of the Daily Mirror Pride of Britain Awards. PC Darren Kirkwood has dedicated his entire adult life to policing. Having had two operations to remove a bone cancer, he was told he'd never be able to cycle again. That didn't stop the 43-year-old and he soon set out to raise money to help those who needed it most. Michael Burton was born in Grimsby. He's made it his life ambition to bring 'Great' back to the town and area. In the last five years, he's managed to raise £250,000 to help 50,000 locals reach their goals. Derek Cartwright, who has epilepsy and is registered disabled, has been fundraising since the age of 10. The 55-year-old from Scunthorpe has raised close to £81,000 for various charities close to his heart. Keira Hayden tragically lost both her partner and her son to Sudden Adult Death Syndrome. The mother from Rotherham has now made it her mission to prevent any more lives being lost. So far, she has raised nearly £30,000 for accessible defibrillators in her local area. Annoula Baker is a 37-year-old woman from York who stepped in to help a family struck by tragedy in the Manchester Arena bombing last year. Annoula helped raised £18,000 for the orphaned daughters of Marcin and Angelica Klis by holding family fun days and boxing fights. She along with her daughter Alena have also raised funds for other families with disabled children. Justin Henderson from North Yorkshire has raised £30,000 over the last four years for Help For Heroes. Six years ago the former soldier broke his back and thanks to the charity he managed to get back on his feet. 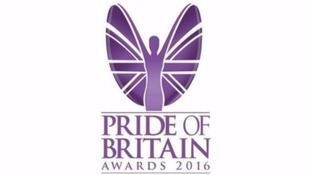 The winners of this year's Pride of Britain fundraiser award from the Calendar region can now be revealed.